This PR is branched from #4480 and contains sections from #4493. It removes the controller endpoints and associated makos for sample requests and external services. These are features being deprecated in 17.09. 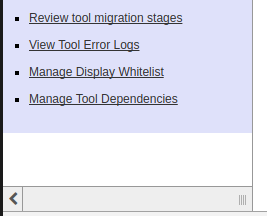 Additionally it reorganizes the left admin panel by reducing it to three categories: Server, User Management and Tools/Toolshed. Works fine / looks good to me. Only comment is with the newer, shorter menu I see a white section at the bottom. @erasche that is unrelated to this PR I think, I saw it before. We need to have another discussion about this I think. There were comments about how/if to proceed with the controllers removal or whether to just bind them to the tracking configuration. ping @martenson. Can we discuss this? It would be nice if we could move forward. It could allow us to complete the mako-to-js transition within this year. Also no one responded to the email we sent out a couple weeks ago. I think this is now ready for merging and I will do so later today, unless there are objections. We got some new failing tests. api test Build finished. 304 tests run, 4 skipped, 10 failed. Thanks for your work @guerler! Thanks a lot for the help and review @martenson.